Even on the East Coast, it’s now Spring. The flowers are coming up, the trees are blooming, and the bees are buzzing. So good to see this is still occurring at a time when the military-industrial is expanding its domestic war games and pesticides are killing honeybees by the millions. On a walk yesterday in the Port Townsend area of Northern Washington state I saw ferns sprouting out of the ground. Soon they will be sautéed for great eating. 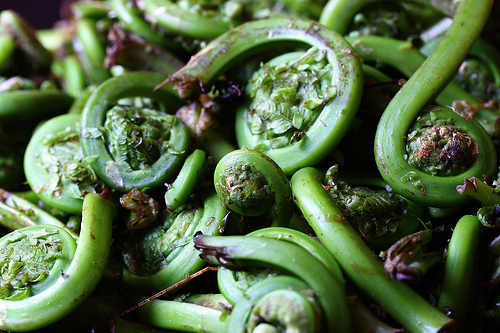 Look up the recipes online for “fiddleheads.” Also ran across one—only one—morel mushroom. What a tasty thing. Time to dig up the compost and mix it into the vegetable beds, and plant the seeds or sprouts. Did you all know that we have an imprint called Process Media with a whole mess of titles in a “Self-Reliance Series” that provide useful, easy-to-follow and well-illustrated information regarding health, growing, and self-protection. You don’t want to be a forever-exploited consumer, and wish to know things that people generally did less than a century ago. Don’t be a victim of ignorance. Get to it. Get Self-Reliant!